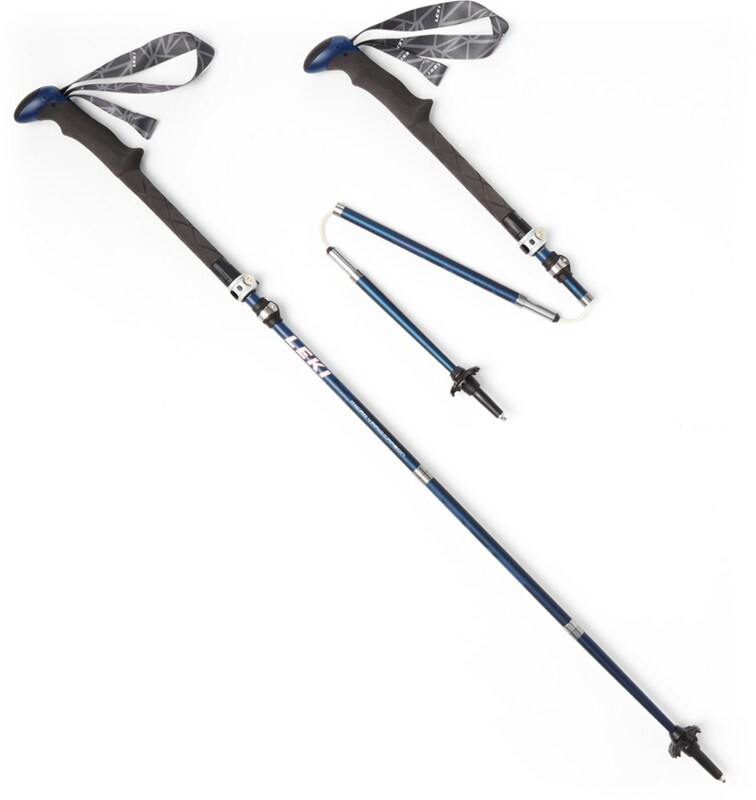 The Stride Lake Tahoe Lite trekking poles are part of a new Trekking Pole line being introduced to the US by the renowned Italian pole maker Gabel. 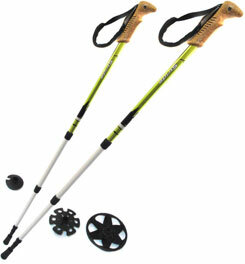 These Trekking poles offer many high end Gabel features at an economical price! 3-section, 6061- T651 Series heat-treated Aluminum shafts have diameters of 18/16/14mm.They adjust from 64-135cm (24.5"-53"). 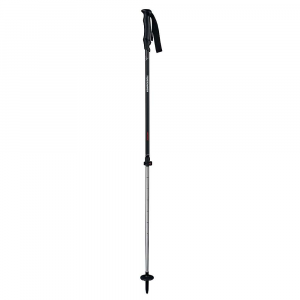 Gabel's TPL-Top Locking System has been developed through 50 years of manufacturing telescoping poles and continues to be one of the most reliable locking systems in the world with a hold of more then 150kg (330lbs). 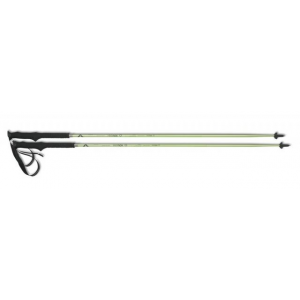 A couple of twists are all it takes to quickly adjust your poles. They have comfortable molded foam grips and padded automatic comfort straps which easily adjust with out the need for a buckle. 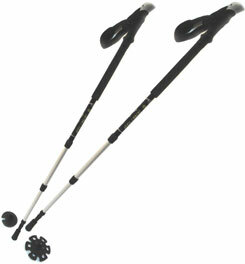 The carbide flextips are replaceable and offer the most secure hold on any terrain and surface. Trekking and Winter baskets included. Color: Silver with Black and Red. 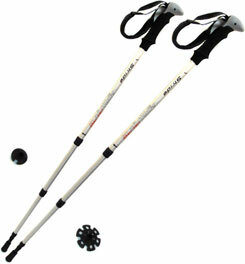 Pack Length 24.5". Weight 17.2 oz. per pair. Made in China.Molded Foam grips: ergonomic design for comfort, grip and durability. Automatic straps: adjust without the use of a buckle for convenience. Aluminum Oxide Coating: protects the pole shafts to help prevent scratching and chipping.TPL-Top Locking System: developed through 50 years of manufacturing telescoping poles and continues to be one of the most reliable locking systems in the world with a hold of more then 150kg (330lbs) Carbide Flextips: concave, cylindrical tips offer secure hold on all terrain and surfaces; Carbide is extremely hard and durable; entire tip ferrule (Flextip) is replaceable. Interchangeable Basket System: baskets easily thread on and off; different size basket options allow poles to be customized for all seasons, all activities (trekking, snowshoe, backcountry touring, etc). 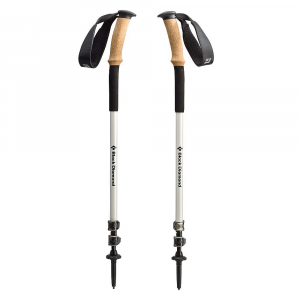 The Gabel Stride Lake Tahoe Lite Trekking Poles is not available from the stores we monitor. It was last seen July 5, 2012	at Campmor.